The Mother of all Vigils (a title attributed to Saint Augustine), is upon us. Tonight, I will sit in a darkened church, illumined by the flicker of candles, and listen to ancient words crafted in the heart of Love. My Lenten journey out of the shadows of sin and slavery is almost complete. One last task awaits me tonight: to be fully attentive to God’s Word and to meditate on His wonderful works. As we listen to these deeds, recounted in seven readings from the Old Testament and two from the New, the Lord “beginning with Moses and all the prophets,” desires to meet us on our journey to the empty tomb, and open our eyes to meet Him in the Scriptures. Here are a few threads from this tapestry of redemption that the Church weaves for us tonight. May it foster in us abiding gratitude for how God has acted to save us. Genesis 1:1-2:2—God is good! His goodness is revealed in the creation of order out of chaos, culminating in the crown of His creation, whom He declared “very good.” Tonight, as you reflect on the goodness of God, expressed in His creation, recognize that He has proclaimed that you are “very good” and thank Him for His wonderful masterpiece. Genesis 22:1-18—God is faithful! He will provide. His faithfulness is revealed in His provision for Abraham’s sacrifice. Tonight, as you reflect on the faithfulness of God who did not withhold His only beloved Son as a sacrifice for you, ask Him to for the grace to respond to His fidelity with ongoing obedience. Exodus 14:15-15:1—God is mighty! He delivers His people from the power of their enemies with great signs and wonders. He is a warrior who fights for us. Tonight, as you reflect on the saving power of the Lord, ask Him to vanquish the Enemy of your soul and then, like the Israelites, rejoice in His saving power. Isaiah 54:5-14—God is merciful! Although we have sinned and wandered far from Him, He calls us back and offers us redemption. God’s love endures forever. Tonight, as you reflect on His merciful love, recall the ways He has redeemed and restored you. If you feel forsaken, know that He is calling you back. Isaiah 55:1-11—God is near! He knows us and invites us in our hunger, thirst, and poverty, to seek Him. As a Father, He promises to care for and satisfy us. Tonight, as you reflect on His nearness, call upon Him and say yes to His invitation; then ask for the courage to extend His invitation to the world. Baruch 3:9-15, 32-4:4—God is wisdom! His wisdom brings strength, understanding and peace. Tonight, ask God to open to you the treasury of His wisdom and to lead you in the way of understanding. Ezekiel 36:16-28—God is holy! His Holy Spirit purifies and renews us so that with a new heart we can live in love according to His ways. Tonight, as you reflect on His holiness, ask Him to make your heart new again and to give you a fresh outpouring of His Holy Spirit. As the lights go up around us, we move in the last two readings (Romans 6:3-11 and Mark 16:1-8) from promise to fulfillment, and death to life. The tomb is empty. He has been raised and His love has triumphed! 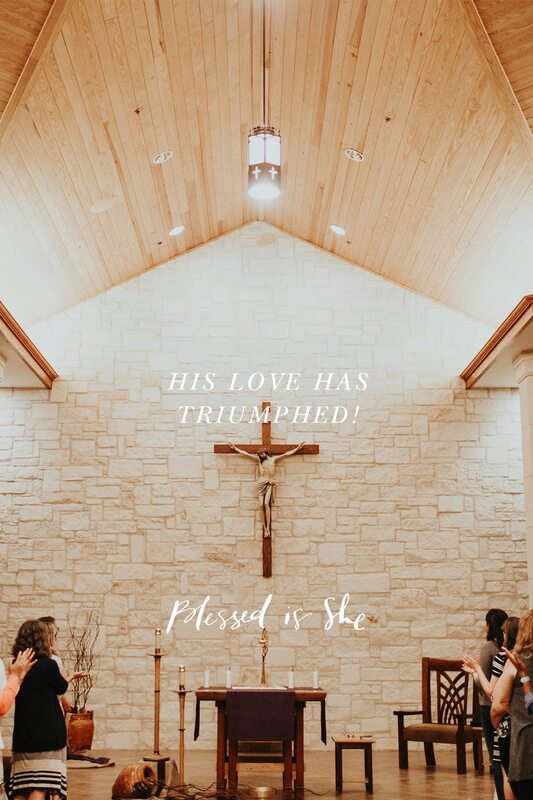 He has been raised and His love has triumphed! Tonight, rejoice in His resurrection and live in the light of freedom and hope. Love the summary of tonight’s readings and overview of what is taking place. So many people miss what the liturgy is trying to invite us into. Thank you.